Anyone who knows me knows that I wasn't a big Pete Seeger fan. In fact, the very first article I ever wrote that evoked angry letters to the editor was a rather snide review of a Seeger concert at Paolo Soleri in 1980. When it came to folk music, I always was more in the camp of rough 'n' rowdy types like Dave Van Ronk. But that's neither here nor there. I was saddened by Pete's passing. 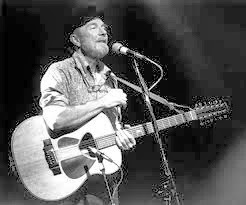 But one thing I admired about Pete Seeger was the way he stood up to the communist witch-hunters during the McCarthy era -- even though it seriously hurt his ability to earn a living. Mr. Seeger was indicted in 1957 on 10 counts of contempt of Congress. He was convicted in 1961 and sentenced to a year in prison, but the next year an appeals court dismissed the indictment as faulty. Plus, I've always loved this song. So rest in peace, Pete. You whipped a lot of old devils.